San Miguel, Ibiza. San Miguel, 4-5 Stars. Sleeps up to 8 people - Minutes by car from San Miguel village and Benirras 'drumming' beach this new villa offers comfort, peace and tranquillity in the midst of the countryside. 20 km from Ibiza Town. Country Holiday Villa - sleeps up to 8 people. Surrounded by rolling countryside and pine trees, this comfortable and well-kept villa lies in a peaceful location, totally fenced for privacy and secure parking. The house is completely air-conditioned and offers four luminous double bedrooms, one en-suite and a further 3 bathrooms. The comfortable lounge is fully equipped with DVD, Satellite TV, CD Player and an iPod dock. The complete kitchen with all its modcons and dining area have direct access onto the terrace where you can enjoy laid-back breakfasts. Wi-Fi access is via broadband. This is where you will be spending lots of time sunning, lounging by and swimming in the pool. The fully-equipped kitchen area outside is ideal for al fresco cooking and dining and there are plenty of shaded areas for reading - or the odd siesta. A table tennis table and card and board games are provided for home entertainments. 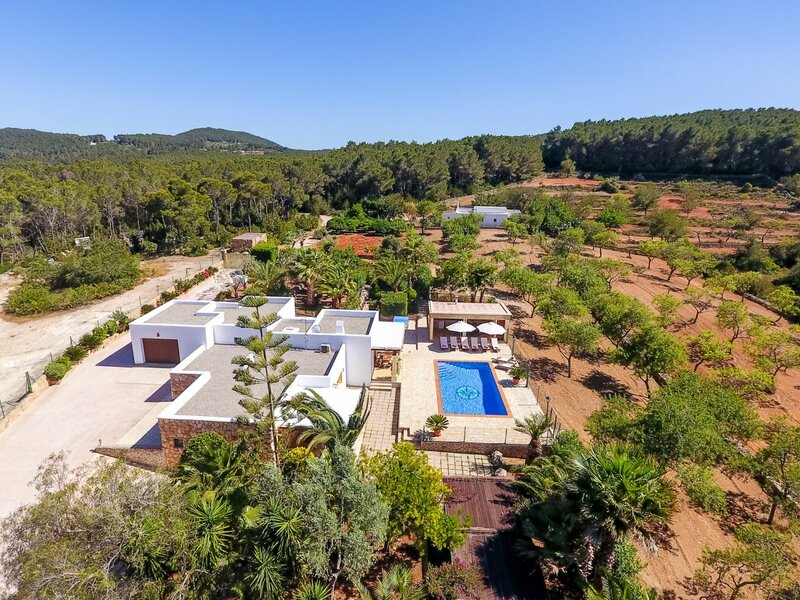 This villa is just a few minutes drive from the typical Ibizan village of San Miguel which has some good local restaurants and bars, shops and a weekly craft market. Benirras beach, famous for its sunset drummers and good beach restaurants is also reached easily by car. The surrounding area has beautiful countryside with some stunning clifftop views over the azure-blue sea. Ibiza Town's great choice of gastronomy and entertainment is only around 20-minutes away. This homely villa makes a perfect holiday home for families looking to spend quality time in a quiet getaway villa. It also makes a great bolt hole from which to discover the island. Flexible arrival day with a minimum stay requirement of 7 nights in high season. Car hire is essential.